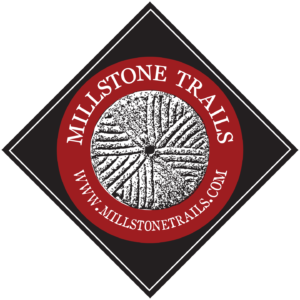 The Millstone Trails Association is a VMBA chapter which maintains a large network of multi-use trails traversing the historic quarry lands of Millstone Hill. The trails wind their way through northern hardwood and coniferous forests and along exposed granite spines. While exploring the trails, be sure to enjoy the unique features of the Millstone area including: scenic vistas of the Green Mountains from towering grout (waste granite) piles, dramatic quarries now filled with turquoise water, and relics from the old quarrying days. The Millstone Trails are made possible because of the generous recreational access offered by the Town of Barre and Rock of Ages quarry corporation. The Millstone Trails Association thanks these and all of their partners, for helping to make this outstanding trail network possible. Alternately, you can become a member of Millstone Trails ($49 Individual/$98 Family) via the VMBA platform and ride all year. You must choose Millstone Trails Association as your primary chapter, or add them to your current VMBA membership(24.50 Individual add-on, $49 Family add-on). Membership has the additional benefit of adding your voice to the conversation regarding not only Millstone Trails, but trail access statewide. As a Millstone member, you’ll also get the full VMBA benefits package.